Pastor George M. Malkmus developed the Hallelujah diet based on what he believes is the ideal diet that God intended for us to eat in the Garden of Eden. He describes the diet as composed of God’s natural foods that are “bountiful in ‘live’ enzymes that nourish cells and provide true energy”. George Malkmus claims to have healed himself from cancer following this diet however it appears that there are no medical records to back up his claim. Reports state that he has since suffered a stroke and high blood pressure and has had to resort to medication to control his condition. The diet is fundamentally a vegan raw food diet. The basic guidelines of the diet are simple: consume 85% raw foods and 15% cooked foods. The cooked portion is usually consumed at the end of the evening meal. On the Hallelujah diet it is recommended to skip breakfast and instead have only barley grass drinks and fresh vegetable juices. Options for breakfast are given for those transitioning from a standard diet and include such foods as fresh fruit salad, whole grain raw granola, almond milk and sprouted grain toast with almond butter. Meat, fish, eggs, dairy products, caffeine and alcohol are strictly prohibited. The Hallelujah Diet also involves the use of a number of supplements including BarleyMax which are sold on the Hallelujah Diet website. Raw vegetable and fresh vegetable juices. Fresh fruits (limited to no more than 15% of daily intake). Raw nuts, nut butter and seeds. Olive oil, flax oil and avocado. Steamed or stir fried vegetables. Steamed or baked white potato, sweet potato and squash. Cooked beans such as lima, kidney, pinto etc. Whole grain breads, pasta and brown rice. Soy cheese, rice milk and small amounts of organic butter and mayonnaise. Raw honey, molasses, carob powder, maple syrup (use sparingly). Herb teas, cereal based coffee replacements, bottled fruit and vegetable juices. BarleyMax followed 30 minutes later by a large green salad with a variety of raw vegetables followed by nut loaf, baked sweet potato, whole grain pasta or vegetable sandwich on whole grain bread. A piece of fresh fruit or a serve of fresh apple or pear juice. Look here for other vegetarian recipes. If desired it is allowable to swap the lunch and dinner options so long as only one meal contains cooked food and the total amount of cooked food does not exceed 15% for the whole day. Exercise is recommended as part of a balanced lifestyle both for weight loss and general health and is advocated as a method to help with eliminating toxins from the body. These exercises can be used with the Hallelujah Diet. The Hallelujah Diet Book $14.99US. If taking all the supplements recommended in the program the cost is approximately $2000 US per year. Many people experience short term health benefits. High content of vegetables provide antioxidants and fiber and are associated with reduced risk of cardiovascular disease and cancer. Low fat diet can reduce blood cholesterol levels. Increases awareness about processed foods in diet. The biblical basis for the diet is questionable as is the belief that there is one perfect diet for all people. Most people will probably not enjoy this style of eating. Many long term followers of the diet have had problems including severe nutritional deficiencies, loss of muscle tone, food cravings, chronic tiredness, depression and premature aging. While it may be beneficial for a short term cleansing diet, the Hallelujah diet is far too low in protein and other essential nutrients to be viable as a health promoting diet over the longer term. Those who are physically active as well as people with digestive disorders or chronic illnesses will especially fall far short of their daily protein needs. Malkmus also makes claims that are not supported by current nutritional knowledge and the ‘proof’ provided is that of testimonials by dieters that have generally only been on the diet for a short time period. If you are looking for a healthy long term approach to weight loss the Hallelujah Diet cannot be recommended. Malkmus, G. H. (2006). The Hallelujah Diet. Destiny Image Publishers. Has anyone ever heard of combining; the problem with eating meat is that people combine starch like potatoes or bread or macaroni; the other thing, I really don’t believe the Bedoins whom I have visited in Israel were making cheesecake out of cashews; they had sheep; they ate sheep; they drank milk; they ate pottage; life was much more simple than the Hallelujah Diet; also, I personally do different food plans at different periods of time; food can get really boring; so, I combine sometimes, do Brody sometimes (meat just for flavor); Akins sometimes and then just raw and whole foods. I also have been making smoothies with frozen bananas rather than yogart for years and use any kind of fruit I want. I have to strongly disagree. Most people REALLY DO enjoy this way of eating and most of the testimonies that are short term is because they had such great success in the very beginning, and it stays that way. Our bodies absolutely do not need more than 10-15 %protein. Our requirement for life sustinance in only 4-6% of our total calories. Go read The China Study, in which Malkmus bases a lot of his claims. You want scientific, peer reviewed, heavily documented research, there you have it. And this diet is absolutely THE BEST long term weight loss and maintenance diet. I am living proof. this diet probably works although if god wanted us to be vegetarians why make animals?hmmmmm msot religions are based on lies. Why don’t u list the Fit for Life and Natural Hygiene Diets? ONE MORE THING: This site is promoting themselves and their diet product. That is why they are against the Hallelujah Diet. If we checked off the other 99 diets listed, we will find that they are not recommended either. FOLLOW THE MONEY! Latonya- This site everydiet.org does not have a diet product for sale…we sell no products and are strictly a diet review site. The book states that people with gluten allergies are helped by this diet because there are substitutes. Don’t knock it until you’ve tried it! We were made to be vegetarians. Read it in Genesis. Man started eating meat after the Flood when no plant food was available. We are able to eat meat, but it causes diseases such as cancer, as well as contributing to high cholesterol and there is nothing really good about it. The blood in meat has the toxins and unpurified junk that the animal had when he was killed. Your kidneys work overtime and are stressed out to process it. Our appetites are perverted and we do not want a healthy plant-based diet. That is why so many are opposed to it. It isn’t salty, sweet or fatty. Blood transfusions and immunizations were at one time scoffed at and banned until it was proven a positive thing. This could well be the same kind of thing–people just need to try it and see if it works. I feel wonderful. This will take over the world eventually. Those who want to eat meat, eat it in moderation as a condiment but not as a main dish. It was never meant for that. We don’t have sharp teeth as carnivores have, and our stomachs provide digestion like a herbivore. Check it out. We don’t need all the protein the govt. says–that is hoopla by the meat/dairy industry for selfish needs. We can and do get all the protein we need by a plant-based diet. Many cultures can tell you this. Get more educated and then come back. Good luck to all. ***Don’t be discouraged by negative things online–just do your homework. Can people with gluten allergies do the diet? I have been doing my own research,checking this diet out for myself. I wonder, if you make the statement above, shouldn’t it be backed up for the whole of your review to be taken seriously? You make a blanket statement about “reports” but don’t site the reports or the source of the reports. How is that credible? You may impress people who want to be impressed by you, but you make me want to check into this diet more closely because you apparently couldn’t find anything to back up this claim. I think that it is amazing to see that there are other opinions about this diet. I am doing a research on this diet and have read nothing, but extrodinary things about it. I for one think that it is a breath of fresh air that someone has decided to challenge this “perfect diet”. I still plan to try it out though for my own experience. 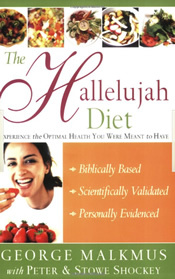 This was a tremendously disappointing and untruthful review of the Halleluja Diet. Obviously you have done your research through biast means.